This article is about the Roman coin valued at a third of an as. 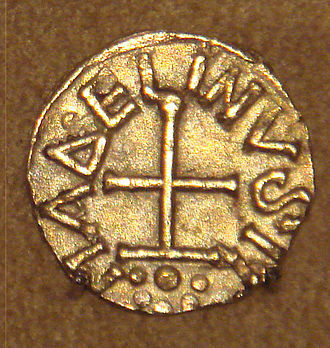 For the later coin valued at a third of a solidus, see Tremissis. The triens (plural trientes) was an Ancient Roman bronze coin produced during the Roman Republic valued at one-third of an as (4 unciae). 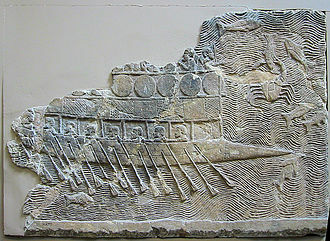 The most common design for the triens featured the bust of Minerva and four pellets (indicating four unciae) on the obverse and the prow of a galley on the reverse. It was not a common denomination and was last struck c. 89 BC. Later, in Frankish Gaul, the term "triens" was often used for the tremissis, since both terms meant "a third". 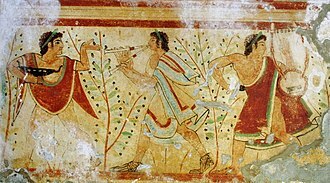 Wikimedia Commons has media related to Triens. 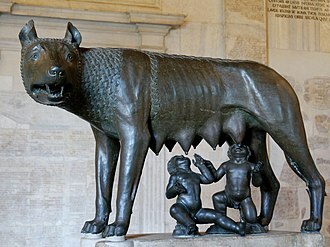 Roman currency for most of Roman history consisted of gold, bronze and copper coinage. 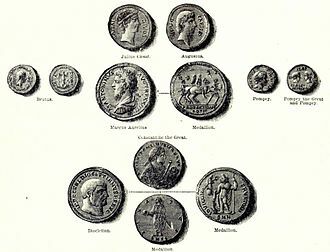 From its introduction to the Republic, during the third century BC, well into Imperial times, Roman currency saw many changes in form, denomination, a persistent feature was the inflationary debasement and replacement of coins over the centuries. Notable examples of this followed the reforms of Diocletian and this trend continued into Byzantine times. 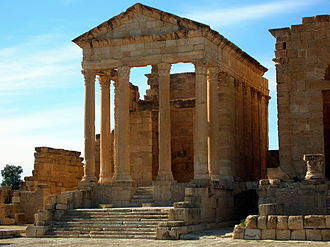 The manufacture of coins in the Roman culture, dating from about the 4th century BC, the origin of the word mint is ascribed to the manufacture of silver coin at Rome in 269 BC at the temple of Juno Moneta. 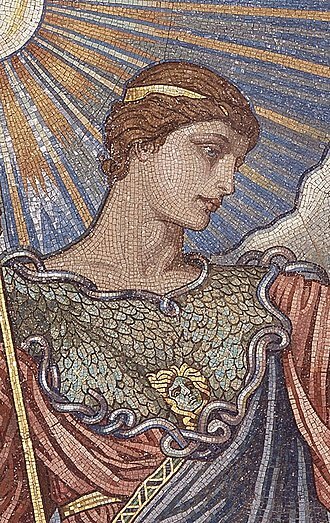 This goddess became the personification of money, and her name was applied both to money and to its place of manufacture, Roman mints were spread widely across the Empire, and were sometimes used for propaganda purposes. 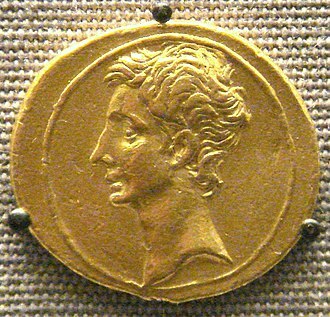 The populace often learned of a new Roman Emperor when coins appeared with the new Emperors portrait. The Romans cast their larger copper coins in clay moulds carrying distinctive markings, not because they knew nothing of striking, Roman adoption of metallic commodity money was a late development in monetary history. Bullion bars and ingots were used as money in Mesopotamia since the 7th millennium BC, coinage proper was only introduced by the Roman Republican government c.300 BC. For these reasons, the Romans would have known about coinage systems long before their government actually introduced them. 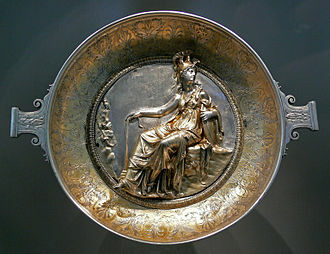 The reason behind Romes adoption of coinage was likely cultural, the Romans had no pressing economic need, but they wanted to emulate Greek culture, and they considered the institution of minted money a significant feature of that culture. However, Roman coinage initially saw limited use. 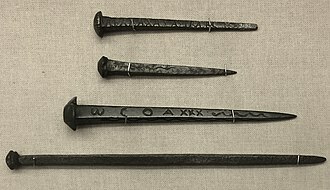 The type of money introduced by Rome was unlike that found elsewhere in the ancient Mediterranean and it combined a number of uncommon elements. 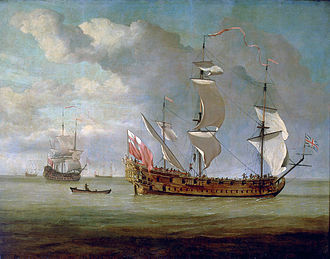 One example is the large bronze bullion, the aes signatum and it measured about 160 by 90 millimetres and weighed around 1,500 to 1,600 grams, being made out of a highly leaded tin bronze. 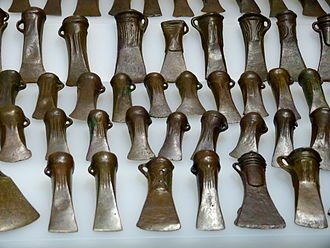 Although similar metal bars had been produced in Italy and northern Etruscan areas, these had been made of Aes grave. 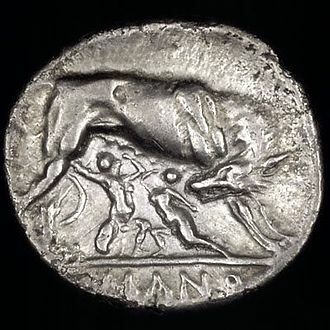 The victoriatus was a silver coin issued during the Roman Republic from about 221 BC to 170 BC. The obverse of the featured the bust of Jupiter and the reverse featured Victory placing a wreath upon a trophy with the inscription ROMA in exergue. 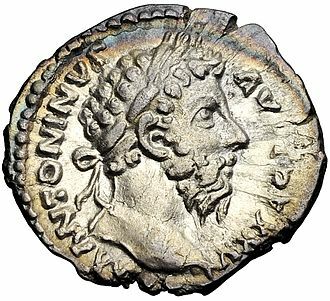 The coin originally weighed about 3.4 grams, meaning that it was half the value of the quadrigatus, the victoriatus was made of a more debased silver than the denarius, which was introduced at about the same time. 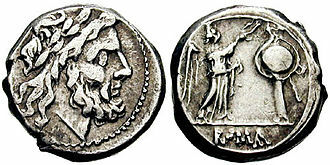 When first issued the victoriatus had a value of about 3/4 of a denarius, however when the quinarius was reintroduced in 101 BC with a similar type, it was valued at 1/2 a denarius. This indicates that victoriati that were still in circulation at time were worn. 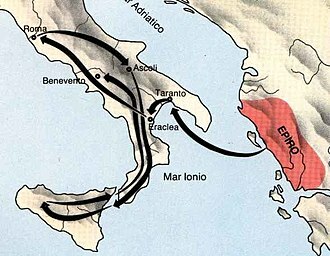 The reintroduced quinarius was produced mainly for Cisalpine Gaul, where the victoriatus, the reintroduced quinarius may have continued to be called a victoriatus, although there is no written evidence of this. The name victoriatus is an ancient term, attested by several contemporary texts, the coin was known as a tropaikon among Greek speakers. The quadrans or teruncius was a low-value Roman bronze coin worth one quarter of an as. The quadrans was issued from the beginning of cast bronze coins during the Roman Republic with three pellets representing three unciae as a mark of value, the obverse type, after some early variations, featured the bust of Hercules, while the reverse featured the prow of a galley. Coins with the value were issued from other cities in Central Italy. 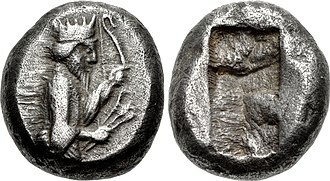 After ca.90 BC, when coinage was reduced to the semuncial standard. It was produced sporadically until the time of Antoninus Pius, unlike other coins during the Roman Empire, the quadrans rarely bore the image of the emperor. The Greek word for the quadrans was κοδράντης, which was translated in the King James Version of the Bible as farthing, in the New Testament a coin equal to one half the Attic chalcus was worth about 3/8 of a cent. In Marks gospel, when a poor widow gave two mites or λεπτα to the Temple Treasury, the writer noted that this amounted to one quadrans. 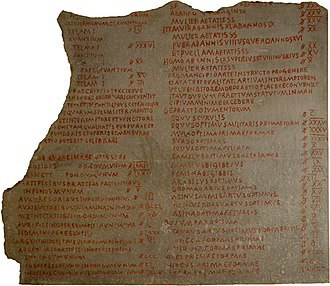 Radiate of Gallienus, discovered in the Vale of Glamorgan.